Home / Releases / 4DO 1.1.2.3 Beta Released! Some minor UI features added in this release. It should make 4DO more user-friendly! Added option to pause emulation when main window loses focus. – Default is OFF. 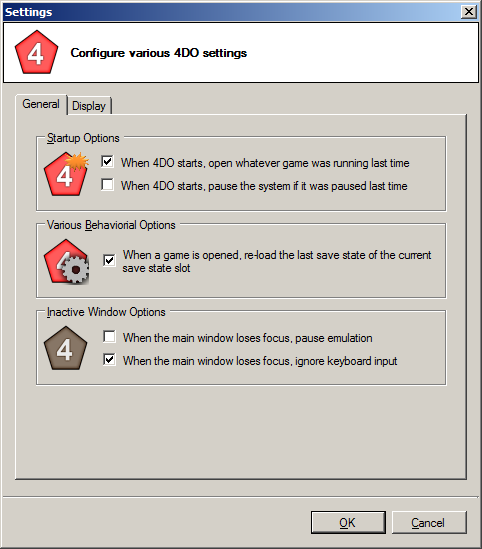 Added option to ignore keyboard input when main window loses focus. – Default is ON.I figured that joystick operation outside of one program at a time was not likely. 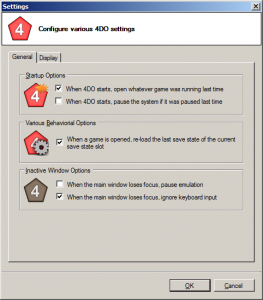 Anybody rigidly opposed to playing the game without the game being the active window is more likely to be appeased with the “pause emulation” option. Display area now redraws itself when necessary if the console is paused. I have also added an updated options screen, including fun little graphics to help explain some of the features to those less familiar with the verbiage in the options. The Shock Wave is running fast, perfect. Nice releases during the last few weeks. The Soundfix and now bin and cue support, thank you for your great work! Johnny, hallo! I want to write new 3do emulator, based on your sources, can you help me??? I wish you luck in whatever project you’re taking on! 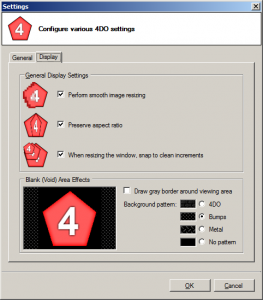 You should be able to access 4DO source code freely on SourceForge. OMG this es really nice, SFII turbo is getting better, filters are nice, running on Windows 7 64 bits, joysiticks and arcade stick work perfect, thanks for this emu guys.